Call Off The Search’s new guest columnist Lisa Malcomess (aka the Lady in the Purple Hat) was tickled pink (and reduced to an adoring, child-like fan) in the presence of Mary Sibande at the opening of her new exhibition, The Purple shall Govern (coincidence? We think not! ), in Cape Town. ‘One glance across the packed courtyard at the opening of her exhibition at the South African National Gallery and I knew instantly who Mary Sibande was. Just as the words strength, beauty and power describe her work, so too do they aptly describe the winner of the 2013 Standard Bank Young Artist award. She is years younger than I am but, still, in the presence of this tall, humble and wonderfully gracious woman I am reduced to a dithering, awe-struck fan. 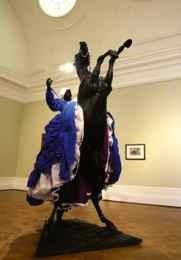 Capetonians are fortunate that The Purple shall Govern, Sibanda’s new exhibition, is in the Mother City for the holidays, before continuing on its tour of the country. 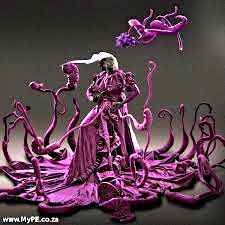 The Purple shall Govern was inspired by the 1989 Purple Rain incident in Cape Town, where anti-apartheid protestors who had attempted to march on Parliament were sprayed with purple dye by police water cannons so that they could be identified later and punished. But this exhibition is so much more than a tribute to those scary but exciting times, when Cape Town became a purple city and graffiti artists bombed the city with the inscription, ‘The purple shall govern’. It is also the story of the transformation of Sophie, Sibande’s alter ego. 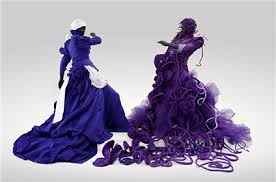 In her blue African Baroque domestic worker dresses, with her eyes closed, we see her dreams, aspirations and fantasies. Then Sophie is in purple, the traditional colour of royalty, interacting with the purple creatures that surround her and gaze up at her, seemingly in admiration, even encircling her head with a halo. This is Sophie’s “Me time”, as the domestic worker’s apron and headscarf are cast aside. I won’t give much more away; I will just say: This is a must-see. If you see just one thing this festive season, this should be it. The gallery also houses Mary’s incredibly powerful The Reign, a magnificent work with Sophie on horseback. At R280 000, it is also the gallery’s most expensive purchase.